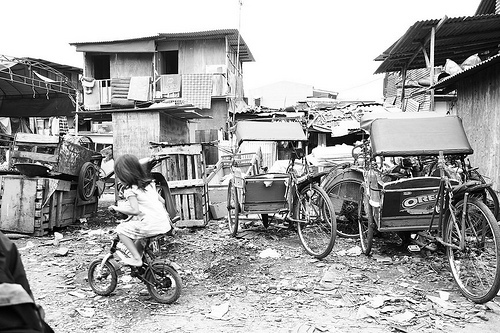 More than a quarter of Jakarta's population lives in slums. Flickr photo from Cak-cak. Jakarta is the world’s sixth most populous metropolitan area. At 18.9 million people, the Indonesian capital’s total population falls just short of metropolitan Mumbai and New York and its built environment covers some 5,100 square kilometers. Experts expect its population to surpass Mumbai 2015. The city is not only a center of government, but also finance, commerce, and education. “A viable solution is to design a mass rapid transportation system to reduce the vehicle population. We cannot afford to build another inner-city toll road or more streets because we have run out of land for such massive construction,” Budi said, adding that so far there appear to be no breakthroughs visible on the horizon. According to the Organization of Land Transportation Owners (Organda), the government’s halfhearted attempt to provide public transportation is the source of the problem. “There’s no political will from the government to prioritize public transportation over private vehicles,” says Rudy Tehamihardja, head of Organda’s land transportation and infrastructure division. With the TransJakarta BRT (nearly 100 km long to date) not quite finished, officials are moving on to an even more ambitious project to build a heavy rail transit system modeled after the Mass Rapid Transit (MRT) system in New Dehli. The first phase of that project (official government website here) is planned to open in 2016 and cover 14.3 km from Lebak Bulus in South Jakarta to Dukuh Atas in Central Jakarta. A future phase would extend the track north to Kota Tua and another track is envisioned running east-west after that. It remains to be seen whether the system will be affordable for Jakarta’s economically disadvantaged populations. The city’s ills are increasingly drawing international attention. It should be interesting to hear the results of the Sustainable Jakarta Convention set to take place next week where leading experts and policymakers from around the world will discus this very important issue. They will be concentrating heavily on Infrastructure planning and transportation needs. Check out “The Places We Live,” an interactive multimedia exhibit currently on display at the National Building Museum in Washington., D.C., that does an incredible job of documenting the life of people who live in slums in Jakarta and elsewhere through captivating pictures and interviews. The exhibit is made possible through a partnership between Cities Alliance, USAID and the World Bank. It was launched as an official program of this year’s World Habitat Day. You can learn more news and outreach activities surrounding this exhibit on a dedicated Web site, OurUrbanPlanet.org.